Its not everyday that you get to go to the happiest place on earth and see someone on stage from little old Crescent City. But last Wednesday, during EPCOTs annual Food and Wine Festival, thats exactly what happened. Chef Robert Laurie took the stage and prepared Cod in Cartoccio with Saffron Butter and Triple Onion Polenta as part of a cooking demo for the annual event. Laurie, a graduate of Crescent City High School, is currently a chef at Cinderellas Royal Table, located inside Cinderellas Castle at the Magic Kingdom in Orlando. His mother, Laura Turner, sister, Juliette Laurie, and brother, William BJ Laurie, are also from Crescent City. After graduating from CCHS, Laurie received his culinary degree from Daytona Beach Community College before going to work at Disney in 2002. Since joining Disney, Laurie has been a chef at several Disney restaurants including the highly rated Jikos located at Disneys Animal Kingdom Lodge and Narcoossees at the Grand Floridian. Laurie started cooking at a young age. We had a rule in our house while Robbie was growing up, said Turner, If you cook you dont have to clean! And Robbie hated cleaning the kitchen. So a future chef was born. When asked what he enjoys most about being a chef Laurie stated, I like taking something most people dont like and making a great dish that they really enjoy eating. Laurie returns to Putnam County often to cook as a celebrity chef in festivals and fund raising events throughout the year, such as the Log Cabin Farm and Vineyards Annual Harvest Festival and The Celebrity Chef Cook Off to benefit the Lee Conlee House. So if you are planning to go to the Magic Kingdom soon, be sure and make reservations, you wont get in without them, at Cinderellas Royal Table, in Cinderellas Castle. Make sure and ask to say hello to Chef Robert Laurie from little old Crescent City, it even says it on his name badge. Well except the little old part. 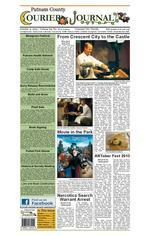 Visit the Putnam County Courier Journals Facebook page for a copy of Chef Lauries cooking demo recipe, its delicious. (2 sections) Opinion.....................A2 Way Back When.......A3 Community...............A4 Church......................A6 Faces & Places........B1 Public Notices..........B2 Crossword/Sudoku..B4In This Issue: Lane and Road Construction Putnam County Bob Martin President Putnam Family Fitness Center The following is a list of roadwork underway by FDOT that may impact trafc through Friday, October 11. Downtown Crescent City: Daytime road closures from 2 to 2:30 p.m. Friday, October 11 for the Crescent City High School Homecoming Parade. Road closures include Summit Street (U.S. 17), Central Avenue and South Lake Street. Motorists may use Read Avenue, Main Street and Huntington Road (County Road 308) as alternate routes. facebook.com/putnamcountycourierjournal From Crescent City to the Castle Putnam County Camp Safe Haven Overnight Camp, which is for teens only, will be held on Friday, October 11, at 4 p.m., until Sunday, October 13, at noon, at Camp Immokalee in Keystone Heights. The teen campers will participate in sports events, such as climbing, swimming and tness exercises. They will also engage in group activities to understand their grief and remember their loved ones. For more infor mation, contact Susan Follick at 352-379-6276 or email her at safollick@havenhospice.org.Camp Safe Haven Bluegrass FestivalThe 6th Annual Fall Palatka Bluegrass Festival will be held at the Rodeheaver Boys Ranch starting on Thursday, October 10, at 12 p.m., and running through Saturday, October 12 until 10 p.m. The Open Stage will occur daily beginning at 11 a.m. Ticket prices vary ($30-$85 for adults, $15-$45 for children ages 6-13 and kids under 6 get in for free with a parent.) Performers for the event include Ted Jones & the Tarheel Boys, The King James Band, Remington Ryde, Rhonda Vincent & the Rage, and many more. For more information or to order tickets, visit www.adamsbluegrass.com. You can also call 706-864-7203 for tickets. The early release date for Crescent City Jr/Sr High School scheduled for Wednesday, October 16, has been changed to Friday, October 11. The Putnam County Master Gardeners Fall Outdoor Plant Sale will take place on Saturday, October 12. Opening at 9 a.m. and closing at 1 p.m. in the Putnam County Extension front parking lot at 111 Yelvington Road, East Palatka. Plants of all kinds will be available-trees, shrubs, vegetables, herbs, ornamentals and owers. Gardening books and other garden treasures will be offered at the Garden Treasure Chest. The Master Gardeners recipe book A Harvest of Recipes will be offered and coffee and donuts will be available. Master Gardeners will be on hand to offer information and suggestions to help you in the garden and landscape. For more information call 386-329-0318.Plant Sale Early Release Rescheduled Lowes in Palatka will be hosting a free kids clinic on Saturday, October 12, at 10 a.m. As part of their Build and Grow program, kids are welcome to come and build a Spooky Stacker just in time for Halloween. Each child will receive a free apron and project patch. Due to popularity, you must register online at lowes.com/buildandgrow.Build and Grow The next Putnam Health Network meeting is on Thursday, October 10, from 12 to 1 p.m., at the Putnam County Health Department annex conference room. Kindred Hospital North Florida will provide a speaker on hospital readmissions, Medicare changes, and other points of inter est. A meal will be provided. Save the date now and make plans to attend.Putnam Health Network C.S. Bennet is a local author who has experienced the competitive world of professional writing. He will be at the library to sign copies of some of his e-books. Afterwards, there will be a Q&A, where he will answer questions and offer advice to aspiring writers about the pros and cons of competitive writing. Bennet is a decorated war veteran from Philadelphia, Pennsylvania, and he now resides in Interlachen. He wrote ten full length novels in the span of 2011 and 2012, and a BS Degree in Social Science, a BA in Science/Public Administration and a BA in Criminal Justice. The event will take place on Saturday, October 12, at 10 a.m. at the Interlachen Library, located at 133 CR 315N. For more information or answers to any questions regarding the event, please contact the Interlachen Library at 386-684-1600 or feel free to stop by the library during business hours.Book Signing The Womans Club of Welaka is hosting a BBQ Pulled Pork Dinner on Saturday, October 12, from 5 7:30 p.m. at the clubhouse, located at 644 CR 309 in Welaka. The evenings menu will include pulled pork, baked beans, cole slaw, a roll, dessert and tea. The cost is a donation of $9. Advanced tickets can be purchased by calling Dee Craft at 386-467-3807 or 386-467-2600, or by visiting their library on Tuesdays, Fridays and Saturdays, between 10 a.m. and 12 p.m., or talk to any member about purchasing tickets.Pulled Pork Dinner The Fruitland Peninsula Historical Societys upcoming meeting will be held on Tuesday, October 15, at 7 p.m. in the Culver Room of the Crescent City Library. A program about William Bartram The rst naturalist who penetrated the dense tropical forests of Florida will be presented by Mr. Michael Adams. Bartram was noted for the quality of his botanic and ornithological drawings. Bartram made many drawings and took notes on the native ora and fauna and the Native American Indians. Refreshments will be available at the close of the meeting. The public is welcome to attend.Historical Society Meeting ARTober Fest 2013ARTober Fest is Saturday, October 12, at the Palatka Memorial Park on the St. Johns Riverfront. Sponsored by Keep Putnam Beautiful and Azalea City Cruisers, the one day event will feature live entertainment from 9 a.m. 6 p.m., arts and crafts sale, business expo, Haunted Maze and Kids Zone, Recycling Regatta at 11 a.m., 35th annual Palatka Car Show from 10 a.m. 3 p.m., a Poker Run & Battle of the Bars Biker Rodeo, barbeque dinners, whole pork butts on sale for $20, novelty foods, helicopter rides for $10, beer and wine sponsored by VFW. ARTober FEST t-shirts and bottle cozies will be available at the event or from Keep Putnam Beautiful 386325-9598 or visit www. keepputnambeautiful. org. The 35th annual Palatka Car Show registration will start at 10 a.m. and run until 1 p.m., with awards at 3 p.m. The awards include Best of Show, plus four Best Ofs and 25 cash awards, dash plaques rst 50, plus 50/50 drawing and silent auction. Visit www.azaleacitycruisers.com for more infor mation. The Poker Run in the East starts at White Eagle Lounge with registration at 10 a.m. and kick stands up at 10:30 a.m. It then runs to Parker House Lounge in Crescent City, Cow Catcher in Pomona Park, Cheyenne Saloon in East Palatka, and ARTober Fest at the Palatka Riverfront. West run starts at Whiteys Fish Camp in Orange Park with registration at 10 a.m. and kickstands up at 10:30 a.m. It then runs to Ronnies Wings in Green Cove Springs, Crossroads Saloon in Palatka, Steamboats in Palatka and ARTober Fest with last bike in at 1 p.m. Battle of the Bars Biker Rodeo Games include great prizes, 50/50 drawing, highest hand from both rides wins cash pot. Visit www.keepputnambeautiful.org for more information.Special to theCourier Journal Photo Special to the Courier JournalMovie in the ParkThe City of Crescent City is hosting another Movie in the Park. This months movie is Hotel Transyvania. The movie begins at dusk on Saturday, October 12, in Eva Lyon Park. Bring your low back chairs and blankets. Light concessions will be available. For more information, call City Hall at 386-698-2525. Tuesday, October 1, The Putnam County Sheriffs Ofce Drug / Vice Unit and Special Operations Group executed a search warrant at 100 Green Drive in Palatka. The search warrant followed an undercover investigation into the sale of narcotics from the residence. The resident, Linda Blaine-Piffner, 25, was charged with sale of cocaine and sale of schedule II narcotics. Blaine-Piffner remains in the Putnam County jail on a bond of $15,008. Two infant children were located in the residence when the warrant was executed and the Florida Department of Children and family Ser vices was contacted.Narcotics Search Warrant Arrest Special to theCourier Journal Mike Jones Staff Writer Photos by Mike Jones Chef Robert Laurie does a cooking demonstration for a crowd of people during EPCOTs annual Food and Wine Festival. Laurie with his mother, Laura Turner. The finished product. A3 OUR TO WN Years Ago...75 years agoOctober 12, 1988 Despite Cool Weather, Thieves want it Cooler Air conditioners may be going out of season, but they proved attractive to thieves on two occasions last week. On Monday, October 3, policed investigated the attempted burglary of Nettles Supermarket in Crescent City. An air conditioner had been removed from a wall, carried some 20 feet away and left beside a fence. Friday, October 7, Howe Memorial United Methodist Church reported someone had broken a window and removed an air conditioner.25 years agoOctober 14, 1938 Super Market Opens Saturday Morning Tomorrow (Saturday) morning the Super market will open with a line of staple and fancy groceries in the building on South Main Street, next to the Journal office. The opening date will have on sale only groceries, cured meats, etc, but plans for the new store to include a modern meat market with a complete line of fresh cured meat, fresh vegetables and country produce. October 10, 1963 Trick-or-Treat Night Decided Attention was called to the fact that last year the youth of the town celebrated Halloween on four nights and drew many protests from citizens. It was recommended that the observance, including trick or treat, be limited to one night, with a curfew limit set at 9 p.m. Commissioners agreed to this, and Halloween night, October 31, was set as the only night such celebration would be permitted within the city.50 years ago 10 years agoOctober 8, 2003 Association sets Mission The Crescent City Area Business Association met Thursday, October 2, and voted on their mission statement. The mission statement includes attracting customers and businesses to the Crescent City area, making the town more attractive, sponsoring events on a regular basis and encouraging people to shop locally. The group also adopted a dues policy. Although anyone is welcome to attend and participate, only dues-paying will vote. Compiled from the Crescent City News, Crescent City Journal, Crescent City Courier Journal, Putnam County Courier Journal and other local news sources. 5 years agoOctober 8, 2008 Theatre returns to South Putnam Theatre will soon return to Crescent City and all of South Putnam. After a 20-year hiatus, Crescent Moon Theatre (formerly the South Putnam Players) is in the advanced planning stages. The first performances are tentatively scheduled for the second weekend in December. They will consist of a series of seasonal-related skits. Way Back When...Special toThe Courier Journal REITER INSURANCE AGENCY, INC.926 N. Summit St. Crescent City, Florida 386-698-2400Call or visit us Visit Us At: www.saravelselfstorage.comCertain restrictions apply.18 different size units available with computerized gate access. RV storage. Climate Controlled Storage Units First month $1.00 Saravel Self Storag e (888) 790-2250 The following appeared in an article in the October 19, 1983, issue of the Courier-Journal. Geetsie was highly regarded and served throughout the community in many capacities. Mrs. Crosby elected to Episcopal Women Fruitland resident and Courier-Journal staffer Geetsie Crosby has been elected to the post of President of the Diocese of Flor ida Episcopal Church Women. A member of Emmanuel Episcopal Church in Welaka for 14 years, Crosby will be installed on October 20, by The Very Rev. Don A. Wimberly at the ECW annual meeting at Christ Church, Ponte Vedra. Crosby has been active in the Episcopal Church Women for more than 40 years. She has served as president of the Palatka-St. Augustine Convocation, and as delegate to the Diocese of Flor ida Convention and to the Triennial National Convention. She was a member of the Diocesan Board and president-elect before her elevation to the presidency. Crosby has been a resident of River Park in Fruitland since 1970. She has worked as an advertising and news consultant with the Courier-Journal for more than 12 years. S ERVICE & B USINESS D IRECTORY AIR CONDITIONINGService In Hours Not Days.100% SATISFACTION GUARANTEED CHECK US ON THE WEB: WWW.SOUTHERNAIR.NET STATE LICENSE CAC058634 3849 Reid St. Palatka Recommended for Decades ANY TIME ANY KIND ANY SERVICEBefore You Fix It Or Buy It,Call 328-3212 AUTO SERVICES 1162 Hwy. 17 Satsuma*Some restrictions applyAir Conditioning Inspection and Re-chargeCOMPUTER DIAGNOSTICSForeign & DomesticDont Wait! Make an Appointment today!! (386) 649-5288MIKE BLACKWELL ROOFING 386-325-2023CCC 025500 CCC 1326232 FREE EstimatesSpecializing in Shingle and Metal Roofs Re-roofs and RepairsMikes AluminumQuality Material and Installation Mike Bottelman, Owner386-649-5374 CONSTRUCTION APPLIANCES NORTH FLORIDA SERVICESPROPANE & NATURAL GAS PIPING AND APPLIANCE INSTALLATION35 Yrs Local Experience Specialties: Tankless Water Heaters and Gas Logs 386-559-0071 APPLIANCES G AS B AIT & TACKLE DavesPRE-OWNED APPLIANCES REPAIRS & REMOVAL(386) 244-4961 J.R. HOWELLSWELAKA BAIT & TACKLE Monday-Sunday 7 a.m.4 p.m.8002 Elm St. Welaka 386-524-4135100 Minnows $10 2 Cups of Worms $7 3 Cups of Worms $10 Shiners 2 Doz. $20 Appliance RepairRalph & Levi 386-546-9897 MUSIC LESSONS PET SERVICES Crescent City Kennel Inc.Pet Boarding ServicesGrooming ServicesTLC Day Care Services for Cats & DogsBasic Obedience Classes Pet Shop Mon. Fri. : 8:30 a.m. 6 p.m.Saturday: 8:30 a.m. 4 p.m.(Closed for Lunch: 12 1 p.m.)Sunday: By Appointment 2620-A S. US Hwy 17, Crescent City www.cckennel.us386-698-2777Advertise Your Business or Service Here 1 in. Ad $20/Mo. 2 in. Ad $40/Mo. 3 In. Ad $60/Mo.Deadline: 5 p.m. FridayCall 386-698-1644 APPLIANCESAdvertise Here 1 in. Ad $20/Mo. 2 in. Ad $40/mo. 3 in Ad $60/Mo.Deadline: 5 P.M. FridayCall 698-1644 SALON T OUCH E OF CLASSSalon & SpaFor appointments call:386-524-4173 377 CR 309Satsuma, FL 32189 Fall Specials:Cut & Color $62Mani/Pedi Combo $30 Make Your Appointment Today for Halloween Hair & Makeup Costume Makeovers 573-693-8045 Guitar Lessons Advertise Here 1 in. Ad $20/Mo. 2 in. Ad $40/mo. 3 in Ad $60/Mo.Deadline: 5 P.M. FridayCall 698-1644 HANDYMAN DeLaneys Enterprise Property Manager Pressure Washing Landscaping Handy ManLook us up onwww.delaneysenterprise.comDont be shy! Give us a call!570-614-4751 (days) 386-649-6675 (after 6 p.m.) Advertise Here 1 in. Ad $20/Mo. 2 in. Ad $40/mo. 3 in Ad $60/Mo.Deadline: 5 P.M. FridayCall 698-1644 SONGRECORD YOUR Record Your Song Affordable & Portable386-467-2144Johnny Owens1897 C.R. 308 Crescent CityEAGLESWINGS77@MSM.COM MUSIC Erectile Dysfunction Drugs May Be Dangerous To Your HealthFREE book by doctor reveals what the Lovarnso WalkerSales Consultant256 Hwy. 17 N., Palatka, FL 32177 (386) 328-8863 Ext. 117 (800) 382-3692 Ext. 117 FAX (386) 328-7222 CELL (386) 559-3512 lovarnsowalker@beckchrysler.com Dr. Walker Curing All Your Automotive NeedsHealth Insurance Marketplace Navigators Available to Help North Central FloridiansHealth Insurance Marketplace Navigators Available to Help North Central Floridians Health Insurance Marketplace began open enrollment on Tuesday, October 1, and Navigators throughout North Central Florida are poised to help consumers explore insurance options and sign up for a plan that meets their needs and budget. WellFlorida Council, the regions Health Insurance Marketplace Navigator program manager, has partnered with ACORN Clinic, Childhood Development Services, Heart of Florida Health Center, Palms Medical Group and Suwannee River AHEC to provide Navigator services. At the onset of the enrollment period, a major focus of the Navigators will be to conduct inreach with target populations with whom the partners are already engaged, while providing phone support for individuals wishing to receive assistance navigating the Marketplace. WellFlorida and its partners will also conduct outreach and enrollment events throughout the area in the coming months. Visit the WellFlorida website at www.WelllFlorida.org for regular updates of these events. Health Insurance Marketplace Navigators are trained and certied to provide unbiased information on health insurance options and to assist with eligibility and enrollment forms. Language translation and hearing impaired ser vices can also be made available to consumers through the help of a Navigator. Navigators are stationed throughout a 15-county area in North Central Florida. To contact a Navigator in Putnam County, you are asked to call the Suwannee River AHEC at 352-317-7261. For general information about the Health Insurance Marketplace Navigator program, marketplace insurance options for small businesses or how you can volunteer with the Navigator program please email marketplace@ wellorida.org. Kelly and Whitney Redford, originally from Western Ken tucky, are the new owners of Hard Dock Caf and Crystal Cove Hotel and Marina. They purchased the hotel, marina and restaurant in Janu ary 2012. This is our first hospitality/ r estaurant venture, said Whitney. We are avid boaters and love the water, which was the draw to the mari na and the property layout. The r esort and ma rina offers 54 rooms, confer ence rooms, 36 storage units, 45 boat slips as well as the new Hard Dock restaurant. Making it the perfect desti nation for everything fr om corporate events, weekend boating en thusiasts, visitors and family r eunions. Whether someone is staying for a week or a few hours we want them to feel as if they have been on vacation while they were here. Said Kelly. The Redfords have been in business to gether for 10 years, owning and operating several commer cial tire dealerships throughout Kentucky, and plan on staying active ly involved in the dayto-day operations of their new venture. We are promoting an inter-coastal nauti cal theme with vibrant colors and an upbeat envir onment with our new restaurant Kelly said. We found that the name Hard Dock Caf would suit our direct relation to our beautiful water views of the St. Johns Riv er. Our remodeling is under way, within the next month you will see a new and exciting atmosphere! We are also excited to have Joe Doty as the General Manager of Hard Dock Cafe, with over 25 years of restaurant experience. His leadership qual ities, Christian val ues and work ethic ar e the attributes that we were looking for to lead our team, said Kelly. We are also privileged to have ex perienced chefs and staf f working with us as well. Our companys philosophy is to give our customers a rea son to buy, Kelly said. Thr ough quality service, an exceptional menu at an affordable price, we believe the customer comes first in everything we do. Kelly and Whitney are making plans for a grand opening for the business in the com ing weeks. They are curr ently open every day to serve custom ers. W e are going to be promoting a grass roots campaign and give our friends and neighbors a reason to come, she said. We will be offering deals on specific nights such as local city and county police officers night or fire fighters and medical person nel night, as well as others. W e truly appreciate our customers busi ness and want to give not only the citizens of Putnam County anoth er dining option, but to bring mor e tourism and opportunities to our area, Kelly said. We look forward to seeing new faces and making new friends. On behalf of our staff and family we want to thank you in advance for your business, we are proud to have the opportunity to bring such a beautiful part of Putnam County on the St. Johns River back to life! A7 EmployFlorida.com 1-866-352-2345 Employ Florida is an equal opportunity program. Auxiliary aids and services are available upon request to individuals with disabilities. The Employ Florida telephone number may be reached by persons using TTY/TTD equipment via the Florida Relay Service at 711. Disponible en Espanol. JOB RESOURCES at EmployFlorida.com helped me nd a new job I enjoy earning higher pay than I did before I was laid off. You too can discover REAL RESULTS with Employ Florida. RANDAL HARDBOWER Industrial Electrician Green Circle Bio Energy Inc. I can help you save time and money. Protecting more of your world with Allstate makes your life easier. And it can put more money in your pocket. Bundle policies for your car, boat, motorcycle, RV and more. Why wait? Call me today.Laura L Turner 386.325.0100Merrill-Hancock & Turner Insurance 1301 St. Johns Ave. Palatka Subject to terms, conditions and availability. Saving vary. Allstate Property and Casualty Insurance Company, Allstate Fire and Casualty Insurance Company: Northbrook, Illinois 2011 Allstate Insurance Company. Eleven Different Sizes from 5x5 to 12x20TWO LOCATIONSBehind Kangaroo on Paradise Shores Road, Crescent City(includes fenced outside storage area) and County Road 309, Fruitland386-698-2002 P&F MINI WAREHOUSE STORAGE City Commission Regular Meeting Agenda October 10, 2013, City Hall 7:00 p.m.1. Invocation 2. Pledge of Allegiance 3. Approval of Minutes: September 12, 2013 City Commission Regular Meeting September 23, 2013 Special MeetingOLD BUSINESS4. Ordinance No. 13-04 Moratorium on Impact Fees (SECOND READING) Patrick KennedyAN ORDINANCE OF THE CITY OF CRESCENT CITY, FLORIDA, ESTABLISHING MORATORIUM ON WASTE WATER, POTABLE WATER, FIRE PROTECTION AND PARKS IMPACT FEES, AND REPEALING THE LAW ENFORCEMENT IMPACT FEE ESTABLISHED UNDER ORDINANCE 05-005; PROVIDING FOR AN EFFECTIVE DATENEW BUSINESS5. Fair Housing Workshop Fred Fox 6. Proclamation 13-01 Recognition of Childrens Grieving Day Rodney Phillips 7. Proclamation 13-02 National Hospice and Palliative Care Month, November 2013 Rodney Phillips 8. Putnam County Community Alliance (formerly Putnam County Anti-Drug Coalition) Proclamation 13-03, National Red Ribbon Week Chris Glymph 9. Rite of Passage Initiative (ROPI) Angel Duke Banks Park Gerald Watson 11. Utility Work Agreement/ Florida Department of Transportation Patrick Kennedy 12. Resolution R 13-11; Start of Plan Year for the City of Kennedy 13. Close regular meeting and convene CRA Board MeetingCRA BOARD MEETING AGENDAA. Open CRA Board Meeting B. City Hall & Police Department Faade Improvements Joan Hagedorn C. Almighty PC Repair Web Advertising D. Wooden Planter Boxes on Summit Street & Central Avenue E. Close CRA Board Meeting and reconvene Regular Commission Meeting 14. Chief of Police Report Chief Robert Johnson 15. Correspondence 16. Visitor and Citizen Communications Speaker is limited to 2 minutes. PLEASE COME FORWARD to the podium and give your name and address before addressing the Commission.Persons with disabilities requiring special accommodations in order to participate in this meeting should contact City Hall at 386-6982525 at least 24 hours in advance to request such accommodations. *NOTE: ITEMS ON AGENDA ARE SUBJECT TO CHANGE* Trunk or Treat Seeks Community SupportOnce again citizens of South Putnam are holding a Trunk-orTreat Halloween activity in the front cor ner lot of Winn-Dixie. The festivities will take place during Crescent Citys scheduled Trickor-Treat hours of 6 until 8 p.m. on Thursday, October 31. The newest trend in Halloween activities, a Trunk-or-Treat, is making Halloween safer than ever. Several families get together and park their dec orated vehicles in a parking lot, open up the trunks or backs of their cars and kids come around to each car to Trunk-or-Treat instead of going house to house to Trick-orTreat. This form of trick-or-treating pro vides the community with an opportunity to come together to make available a safe and efficient manner in which children may collect treats. Many residents live in rural areas where trick-or-treating is not possible due to limited lighting and the distance between houses. Trunk-or-Treat provides an opportunity for families to experience the enjoyment of decorating for the holiday and giving out treats. The level of par ticipation is based on each individual. Decorations for cars, trucks and trailers must be suitable for young children, but are not required in order to par ticipate. Set-up will begin at 5 p.m. This event is being organized by private citizens, therefore, donations and participation would be greatly appreciated and will help to provide a positive, memorable experience to the youth of our area. Special recognition will be provided to citizens and businesses who contribute to this event. For questions or donations, please contact event organizer, Tasha Newbold at 386-5592756. Special to the Courier Journal If You Need To See Better... You Need To See Dr. Kane PALATKA 328-8387Visit Our Website: www.seedrkane.com QUALITY EYECARE / AFFORDABLE PRICES Azalea Eyecare Center Hard Dock at Crystal CoveKelly and Whitney Redford.